It's going to be a busy weekend! Four big things are happening this weekend to make note of. #1 Oktoberfest brought to you by George Streetfest on Main! This will be on Friday from 6:00 pm until midnight. It is free to walk around and enjoy the entertainment. There will be plenty of food trucks and restaurants to buy some dinner. Ancestor Square will have an adult section for Oktoberfest festivities. #2 Monster Truck Insanity Tour in Parawon. This is on Friday and Saturday at the Iron County Fairgrounds. Buy your tickets online in advance to save some money! Advance tickets are $8 for children and $16 for adults. You can buy your tickets by clicking here. #3 The National Dance Company of Siberia is performing at DSU Cox Performing Arts Center on Saturday at 7:30 pm. I think that would be a fun thing to go see. Tickets are $25 for adults and $15 for youth. For more information and to buy click here. 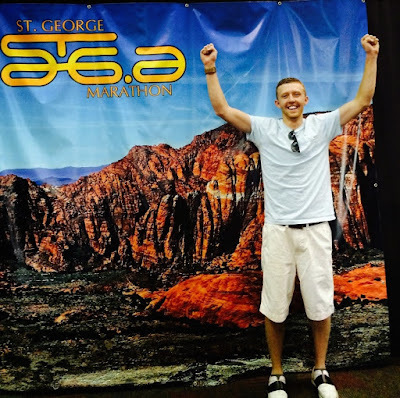 #4 The St. George Marathon is on Saturday!! Two of my brothers are going to be running. Eeeek!! I'm so nervous for them but they will do amazing. Chase ran it last year and was incredible! This will be Mason's first year. The Altra Health & Fitness Expo for the marathon will be on Friday from 9 am - 9 pm at the Dixie Convention Center. This is where the runners will pick up their packets. The pasta dinner for runners and their guests will be on Friday from 4:00 pm - 8:00 pm at the Dixie Convention Center. The cost is $10 for adults and $5 for children. Saturday is the marathon!! There will be an awards ceremony for finishers 1 - 4 in each division under the Vernon Worthen Park Gazebo at noon. It is so exciting to cheer on the runners! You don't want to miss it. Click here for more information about the marathon. Chase right after... :-) Super proud of him.